Its gleaming spire is thickly plated in gold and liberally crowned with diamonds, rubies and other precious gems. 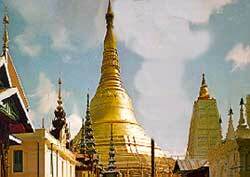 The Shwedagon Pagoda was built to house sacred hairs of Buddha. The structure stands nearly 100-meters (300-feet) high on top of a strategic hill. This allows it to command the skyline of Yangon (formerly Rangoon), the capital of Myanmar (formerly Burma). Evening spotlights give the Shwedagon Pagoda an entirely different visual aura. Its golden surface glows as if internally lit. An eye-catching complex of religious buildings closely surround the Shwedagon Pagoda, making the setting even more enthralling. No one knows for sure the age of the Shwedagon Pagoda. Experts give estimates ranging from 1000 to 2500 years, dating it back to the time of Buddha. What historians do know is that over the centuries it was destroyed by earthquakes and quickly rebuilt, usually to higher heights. Some people call this wonder the Shwedagon Pagoda. Some call it a stupa. Both names are correct (it's a matter of cultural semantics). I use the more widely used version.